Homemade puff pastry and Vienna sausages sprinkled with sesame seeds. The perfect snack for any time of the day, ready in 60 minutes! On a well floured surface, roll the dough out into a large sheet 40 × 60 cm / 15.7″ × 23.6″. The sheet should be 3mm / 0.12″ thick. Cut the dough into rectangular pieces, any size you want. Brush the edges of each piece with egg white. Cut the sausages into pieces and place them at the one end of each rectangular. Roll towards the other end, creating small cylinders. Transfer onto a baking sheet covered with parchment paper. 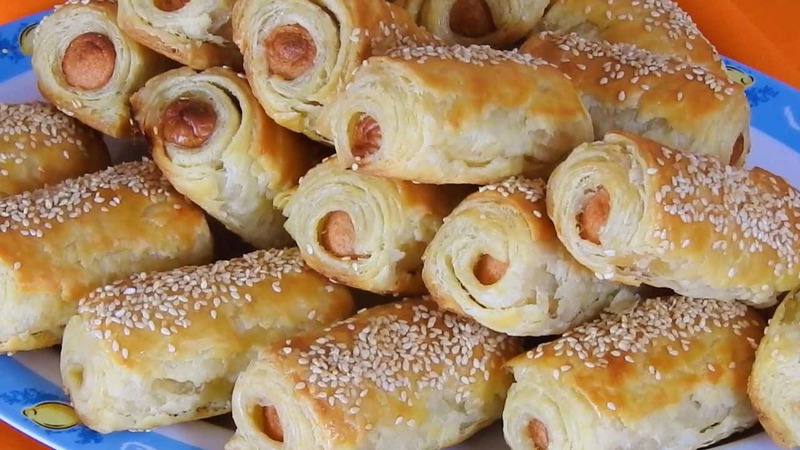 Beat the egg and brush the sausage rolls. Bake in a preheated oven, at 190°C / 375°F for 25 to 30 min.